As teachers, you know that follow-up is key after parent teacher conferences. But what you might not be focusing on is following up with your students. Students are often curious and slightly apprehensive about what you might have learned from their parents during the parent/teacher conferences. 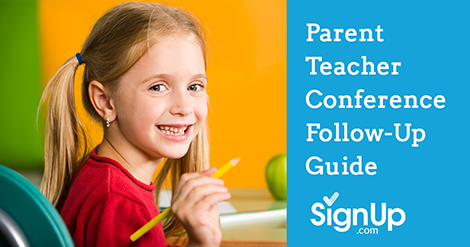 This year, why not have a short follow-up conference with your students to reassure them and develop an action plan for addressing parent concerns. Use these helpful tips to build a deeper relationship with your students. 1. Keep It Safe. Be wary of revealing anything you learned of a confidential nature from your student’s parents or guardians. Your student might feel betrayed by his parents if they’ve revealed something he wasn’t ready to share. Avoid embarrassing your student with funny stories you learned during the conference. 2. Keep It Short. Try not to overwhelm your student with action items resulting from the conference. Simply touch base, give a broad overview of what was covered during the conference, and list one or two things that you can work on together. 3. Keep It Reassuring. Students really want you to like their families, and they really want their families to like you. Everything goes smoother if the adults in a kid’s life are working collaboratively and getting along. 4. Keep It a Conversation. Remember that student/teacher conferences build good working relationships between you and your students. Avoid lecturing, or presenting a long to-do list. Respectfully listen as your students express concerns or opinions. 5. Keep it Positive. Express your confidence in the student, and your belief that she can reach her potential in class. By involving your students directly in their educations and creating an environment of mutual admiration and respect, everyone wins.